It is very rare these days that I get to review metal music made by people of approximately my age. It is rarer still that I can review something done by someone almost 20 years my senior, by someone who helped shape my music tastes. It is impossible for me to forget how we drank, partied and enjoyed our teenage years back in Kiev, Ukraine, while listening to Accept. Along with Judas Priest, closely followed by Black Sabbath and Iron Maiden, Accept was one of my favorite bands. The songs were melodic, energetic, and what then sounded pretty raw. The unusual and distinct voice of one Udo Dirkschneider was another huge draw for the band. At some point Udo left Accept and created his own outfit U.D.O., starting to release albums with the dizzying frequency I failed to keep up with. Years flew by, my country of residence changed, not to mention my metal music tastes, so now I would look at U.D.O. albums with a tinge of nostalgia. I do not expect any of them to be a revelation anymore, but want an hour or so of a simple uncomplicated heavy metal pleasure. I am far from an ardent follower these days. From time to time I would get my hands on an U.D.O. release, but, honestly, those times happen when an album just basically falls into my lap by accident. Decadent is that case exactly, so my expectations were definitely measured, and I was able to settle in and enjoy the album for it is worth. 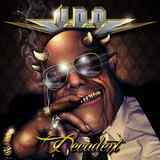 Time and time again Udo proves completely capable of delivering a well-crafted, general issue heavy metal album. His skill in creating a lead single type song (Speeder), headbanging militaristic riffs (title track, Untouchable) or sing along choruses (title track, Pain) is as strong as ever. As they say it in Russia, the country where U.D.O. is extremely popular, you cannot drink away your mastery. The man’s voice, even if helped by modern production values, is still going strong. Semi-balladic Secrets in Paradise and closer Words in Flame are testament to that. Without that voice U.D.O. albums would have been a mockery, and they are certainly not. Changing the lineups constantly, Udo is still able to surround himself with quality musicians capable of delivering tight riffs and fluid leads. And as much as lyrical matter is often an afterthought in the realm of heavy metal U.D.O. calls home, Udo is still able to relate to modern social issues, basically describing the 1-99% divide wracking the world today. Being German, he has an excellent knack to put the issue at hand in simple, easy to grasp lyrics, whether when he sang about child soldiers almost 30 years ago (They Want War on Animal House), or when he is singing about unfair exploitation today (title track on Decadent). But then, to be fair, Decadent is another one in a row of many U.D.O. albums of late. Those who listened to all of them could be in better shape to compare, but I contend Decadent is no masterpiece. The faster songs blend together somewhat, making them indistinguishable from each other (House of Fake, Under Your Skin, Rebels of the Night). An attempt is made to space them apart enough, but that causes the second half, right after Meaning of Life or so, to become filler suspect. There is probably no need for the album to last almost an hour. Then there are also some strange effect choices in Mystery and Untouchable, which made me scratch my head a bit. Yet, for a 35-40 years veteran of metal Udo is impressive. Honestly, I would like to see myself showing this much quality in my chosen profession 10-20 years down the road.